Performance Elastomers Market size was recorded at around USD 8 billion in 2016 and will witness growth at over 7.5% CAGR from 2017 to 2024. Incessant efforts by the automobile and aerospace component manufacturers to reduce their vehicle weight while improving its operational characteristics will augment the global performance elastomers market in the coming years. These manufacturers face regular challenges of finding materials that can cope with extreme temperatures from sub-zero to engine block heat, exposure to hydrocarbons such as fuel, lubricants, and coolant, as well as various chemical reactions involving ozone, nitrous oxides, sulfides, and various other salts. Rising automobile sales around the globe, especially in the developing nations of Asia Pacific such as China, India, South Korea, and the Southeast Asian countries, will positively influence the overall performance elastomers market. Both China and the U.S. witnessed a shift towards high performance and relatively expensive sport-utility vehicles and crossovers from normal passenger cars in the past year and this trend will continue in the coming years as the per capita income of the population increases. The performance elastomers market includes various specialty products such as hoses, seals, gaskets, timing belts, diaphragms, etc. and is extensively where a very high durability with minimal degradation over long time periods is required. Continuous development in the industrial sector around the globe in order to increase the efficiency of different machines such as power generators, motors, oilfield exploration machineries, mining equipment, etc. will have a significant influence on the industry growth throughout the forecast span. According to the world bank, value addition from manufacturing sector increased from USD 1.92 trillion in 2010 to USD 3.25 trillion in 2015 in China, paving ways for numerous industrial innovations in the region. One of the major restraining factors for the global performance elastomers market growth is the high cost associated with the product manufacturing. Processing of these products to provide the required toughness and heat and chemical resistance tends to increase the cost of these specialty products over the standard commodity elastomers. Specific and critical application areas of these products make their use obligatory, thus increasing the product cost. This factor will have a negative influence on the performance elastomers market in the coming years. Silicone based products dominated the overall performance elastomers market with over a third of the market share in 2016. Among the different silicone products, the most popular product type was high consistency silicone rubber accounting for over USD 1.5 billion in 2016. Temperature resistance of the product lies close to that of the fluorine based products, including fluoro-silicone and fluorocarbon rubber, and it is available at relatively low price, making it a product of choice among various end-users. Performance thermoplastic elastomers accounted for over a quarter of the global market size and will witness a steady growth throughout the forecast span. This product segment has been further categorized into thermoplastic copolyester (TPE-Co), thermoplastic polyamide (TPE-PA), thermoplastic vulcanizate (TPE-V), and others including aliphatic thermoplastic polyurethane (A-TPE-U), thermoplastic acrylates (TPE-Ac), etc. Fluoroelastomers will be the fastest growing product segment of the global performance elastomers market due to its extremely high thermal and chemical resistance. High product price will characterize the segment as its application in majorly concentrated in the automotive and transportation sector. Automotive & transportation sector is the most dominant end-user industry for the global performance elastomers market accounting for more than half of the overall share. The product can easily withstand high temperatures inside the engine cylinders and can replace metal parts to assist in the overall vehicular weight reduction. These specialty products are used to make various critical OEM as well as replacement parts for automobiles as well as airplanes. Industrial machinery sector accounted for over USD 800 million for the performance elastomers industry in 2016. These products find use in the manufacturing of various equipment and machineries where harsh ambient conditions are prevalent, such as in oil rigs, metalworking and foundry industries, smelting applications, etc. 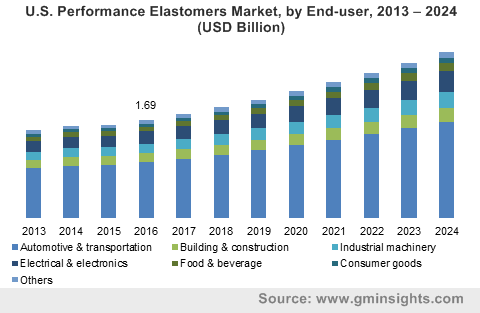 Asia Pacific, driven by the vast manufacturing base in the emerging economies of the region, will hold sway the global performance elastomers market throughout the forecast span. The regional market was worth more than USD 4 billion in 2016 and will have the fastest growth rate in the next seven years. Product demand from various end-user segments in the region will witness immense growth in the near future as local consumer purchase parity increases with the evolving middle class population. 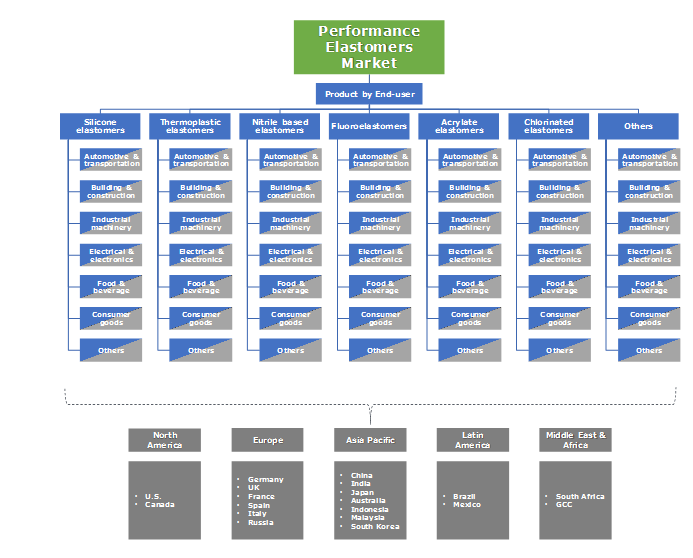 North America and Europe had a combined market share of around 40% of the global performance elastomers market in 2016. These regions will witness slow to moderate growth trends and lose their shares to the developing regions such as Asia Pacific and Latin America. This can be accounted to the shift of the manufacturing units towards these regions, driven by low cost labor and lenient government norms. Global performance elastomers market competitive landscape is characterized by the presence of several corporate giants such as Dow Dupont Inc., Arlanxeo, Momentive Performance Materials, Solvay, Exxon Mobil, Zeon Chemicals, The 3M Company, Dow Corning, Wacker Chemie, Tosoh Corporation, Mitsui Chemical, Daikin, Shin-Etsu Chemical, etc. There are several other important market players involved in the development and marketing of these specialty products. These companies focus on continuous R&D works to develop new product chemistries and meet specific customer demands, thus enhancing their portfolio and maintaining their position in the performance elastomers industry. They also participate in different merger and acquisition activities in order to expand their production capacities as well as global reach. Performance elastomers market is said to represent close to 5% of the entire elastomers market and are well differentiated on the basis of performance characteristics that gives them the ability to withstand extreme environments involving heat, chemicals, gases, solvents, stress, etc. While commonly used styrene-based rubber and natural or crumb rubber tend to fail at temperatures ranging from 100 to 150?C, performance elastomers such as silicone and certain thermoplastic elastomers exhibit excellent performance at temperatures over 150?C. Rising demand from specialty product manufacturers with their primary focus on the product characteristics will enhance the performance elastomers market substantially in the coming years.